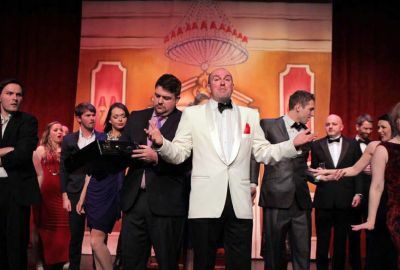 Following their recent productions such as Legally Blonde and Hairspray, Cygnet Players invited me along to their next production, Dirty Rotten Scoundrels. Dirty Rotten Scoundrels is a musical based on the 1988 film of the same name. 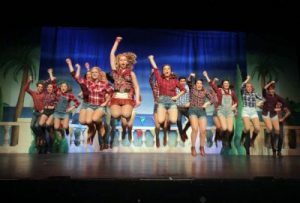 The West End version opened in 2014 and ran for just under a year. The show tells of con-artist Lawrence who hears of a new con-artist in town. On the train Lawrence hears Freddy coning women out of their money, although nowhere near in the same league as Lawrence. Freddy ends up at Lawrence’s mansion where he agrees to take him under his wing and show him how to make it in his league. Eventually Lawrence begins to think that there isn’t enough room for the both of them and they agree on a deal. The first to make $50,000 out of Christine Colgate, the American Soap Queen is the winner and the other leaves town. Of course inevitably things don’t run smoothly and both Lawrence & Freddy encounter some difficulties along the way. The thing that really hit home with Cygnet Players production of Dirty Rotten Scoundrels was the strength of the 29 strong ensemble. They mainly featured as maids and hotel staff but with them appearing in the majority of the numbers they were kept busy with a variety of songs and dance routines to learn. Each of them committed to their character well and often I found myself watching them rather than the main action that was taking place, sometimes a positive, sometimes distracting. There was a good amount of direction given to them ensuring that at all times they had a reason to be on stage with attention to detail high and adding to the comedy of this show. Despite the huge chorus the stage never looked over-crowded and plaudits must go to the choreographer, Kim Schenkelaars, for this. The ensemble were moved around the stage well in dance numbers and mention must go to ‘Great Big Stuff,’ where there seemed to be a never ending stream of maids appearing. Some of the featured dancers were great to watch and any society would be lucky to have them as members. In some of the numbers where just one or two dancers were featured I would imagine that this has been added in to give the dancers something more to do. Sometimes additions like this can look awkward but this wasn’t the case in this show and it in face showcased some of the dancing talent even further. The female leads were all very well cast. Charlotte Donald as Christine had a strong voice and this coupled with her comedy timing meant she suited the part well. Muriel was played by Katy Thompson. Her mannerism were perfect as Muriel and her scenes with Andre (Russell Bramley) had me laughing out loud at several points. Rachel Kitchen’s portrayal of Jolene was one of the highlights of the show for me. She had great energy and led the number Oklahoma brilliantly. Her comedy timing her facial expressions in ‘All About Ruprecht’ really set the number off well. The male leads were played by Jonny Clines as Lawrence and Russell Hughes as Freddy. Both these gentlemen captured the characters well and Hughes crass and vulgar Freddy really contrasted nicely with the Cline’s portray of a suave Lawrence. My main quibble with the Clines & Hughes would that I would have liked their voices to be stronger. I also thought Cline’s needed to be slightly more charismatic in order for me to believe that he had fooled all of these women with apparent ease. The set also deserves a mention as it is supposed to frequently give the feel of opulence and it switches locations numerous times, presenting a challenge for any set designer on a budget. The set, provided by UK productions, was well utilized by the cast and scene changes were well thought out and executed well ensuring there was no lengthy black-outs. Cygnet Players should once again be rightly proud of what they achieved with Dirty Rotten Scoundrels. Comedy is notoriously difficult to do well but they sailed through this with ease giving us frequent laughs, toe-tapping dance routines and left me wanting to download the cast recording so I could relive some of the numbers.